Irrational Games (known as 2K Boston between 2007 and 2009) was an American video game developer founded in 1997 by three former employees of Looking Glass Studios: Ken Levine, Jonathan Chey, and Robert Fermier. The studio was acquired by Take-Two Interactive in 2006. The studio was known for its games System Shock 2, Freedom Force, SWAT 4, and most notably two of the games in the BioShock series. In 2014, following the release of BioShock Infinite, Levine opted to significantly restructure the studio from around 90 to 15 employees and focus more on narrative games. In February 2017, the studio announced that it had been rebranded as Ghost Story Games and considered a fresh start from the original Irrational name, though still operating at the same business subsidiary under Take-Two. 1997 – Irrational Games studio formed by former Looking Glass Studios employees Ken Levine, Jonathan Chey, and Robert Fermier. 1999 – System Shock 2 released to critical acclaim. 2000 – "Irrational Games Australia" studio is opened in Canberra, with Jonathan Chey taking the helm. Deep Cover is cancelled. 2002 – Legal issues with publisher Crave Entertainment result in the development of The Lost being halted. 2004 – Irrational designers Ed Orman and Dean Tate awarded "Best Design" in the Australian Game Developer Awards, as well as the studio receiving "Best Game of 2004" and "Best PC Game". 2005 – Irrational's Boston studio moves to larger office space in Quincy, Massachusetts. The studio retains the "Irrational Games Boston" title. 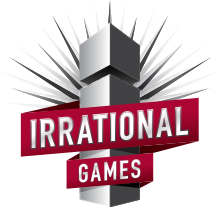 2006 – Irrational is acquired by Take-Two Interactive, under the 2K Games publishing arm. 2007 – Irrational Games is renamed to 2K Boston and 2K Australia on August 10. BioShock released August 21 to wide critical acclaim and strong sales. 2010 – 2K Boston announces its return to its original name, "Irrational Games" on January 8. 2013 - Irrational Games releases BioShock Infinite on 26 March to critical acclaim, selling 11 million copies as of May 2015. 2017 - Irrational Games is renamed "Ghost Story Games" on 24 February. Shortly after BioShock was released, rumors arose that many of the staff who had worked on the game were leaving 2K Boston/Australia. In 2007, five members of the 2K Boston team moved to a new 2K Games studio in Novato, California. Soon after, 2K Games announced the formation of 2K Marin in Novato. In late July 2010, several media outlets reported that a recently created website, whatisicarus.com, was a promotion relating to Irrational Games' unannounced project. The following week, information about the game was again teased, with the trailer confirmed for release on August 12, 2010. This was eventually revealed to be BioShock Infinite. Before Irrational started development on BioShock Infinite, the studio did preliminary work for the XCOM project that later became The Bureau: XCOM Declassified. On February 18, 2014, Levine announced that the vast majority of the Irrational Games studio staff would be laid off, with all but fifteen members of the staff losing their positions. Levine said that he wanted to start "a smaller, more entrepreneurial endeavor at Take-Two", speaking to how much stress completing a large game like BioShock: Infinite had caused him. Levine said "I need to refocus my energy on a smaller team with a flatter structure and a more direct relationship with gamers. In many ways, it will be a return to how we started: a small team making games for the core gaming audience." Levine had considered starting a new development studio for this, knowing that building the ideas would take several years before any game product would be made, but Take-Two offered to let him keep the division within Take-Two, with Levine saying that they told him "there was no better place to pursue this new chapter than within their walls". The studio helped to find positions for the displaced employees, and 2K Games hosted a career day for the remaining 75 employees to help seek employment at 57 other studios. Levine and the 15 remaining members of the team began the process of creating new, smaller games focusing on a replayable narrative for the core gamers. It was said that Levine's studio will continue to keep the Irrational name, although Take-Two later stated that it was not true. Through 2014 to 2015, Irrational Games continued to post several openings for jobs at the studio. In January 2015, Levine and the remaining staff are currently developing their first game which will be a "first-person sci-fi" game. On February 23, 2017, the studio announced it had rebranded itself as Ghost Story Games, founded by 12 of the former Irrational members with Levine continuing as president and creative director. The studio's focus is "to create immersive, story-driven games for people who love games that ask something of them"; the name was chosen as ghost stories "are immersive, exciting, and steeped in community", similar to the studio's design philosophies. As of this point, the studio had about 25 employees. ^ "The Australian Game Developers Conference". www.agdc.com.au. Retrieved May 17, 2018. ^ "Irrational Games Renamed 2K Boston and 2K Australia". Business Wire. August 10, 2007. Archived from the original on September 30, 2007. Retrieved September 16, 2010. ^ "Q&A: Ken Levine talks BioShock, reminisces about X-Com". GameSpot. March 20, 2009. Archived from the original on June 28, 2010. Retrieved April 9, 2009. ^ "Take-Two confirms 2K Marin". GameSpot. December 17, 2007. Retrieved April 9, 2009. ^ Totilo, Stephen. "BioShock Creators' Next Game Debuts Next Week, Trailer On Aug. 12". Kotaku. ^ Plante, Chris (March 6, 2014). "The final years of Irrational Games, according to those who were there". Polygon. Vox Media. Retrieved March 6, 2014. ^ a b c d Makuch, Eddie (February 18, 2014). "BioShock creator Irrational Games is shutting down". GameSpot. Retrieved February 23, 2017. ^ "Irrational Games closure led to 75 layoffs, job fair hosted 57 studios". Polygon. February 28, 2014. Retrieved April 15, 2014. ^ Morris, Chris (May 14, 2014). "Take-Two CEO open to buying more studios". GamesIndustry.biz. Retrieved May 14, 2014. ^ Gera, Emily (November 24, 2014). "BioShock developer Irrational Games is hiring again". Polygon. Retrieved April 20, 2016. ^ Tach, Dave (May 6, 2015). "BioShock creator Irrational Games continues to hire for its mystery project". Polygon. Retrieved April 20, 2016. ^ Frank, Allegra (December 11, 2015). "Irrational Games hiring for 'narrative first-person shooter' project". Polygon. Retrieved April 20, 2016. ^ Phillips, Tom (January 28, 2015). "BioShock creator Ken Levine teases new first-person sci-fi project". Eurogamer. Retrieved May 28, 2015. ^ a b Pereira, Chris (February 23, 2017). "Former BioShock Studio Irrational Games Adopts A New Name". GameSpot. Retrieved February 23, 2017. ^ Hall, Charlie (February 23, 2017). "Irrational is now called Ghost Story Games". Polygon. Retrieved February 23, 2017. ^ Chalk, Andy (February 23, 2017). "Irrational Games is gone—say hello to Ghost Story". PC Gamer. Retrieved February 23, 2017.